I was going through the comments on my blog last night when I came across one that took me by surprise – and in a very good way! 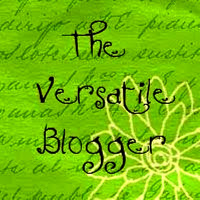 The lovely Reese over at The Importance of Being Reese has presented me with the Versatile Blogger Award. If you aren’t familiar with her blog be sure to head over and check it out. There’s a little bit of something for everyone! I normally don’t put a lot of stock into awards because they are, for the most part, just glorified popularity contests. However, I adore this award because it was given to me by a peer, no nominations, no voting, just one blogger recognizing another and I honestly don’t think you can get any higher praise than that! 1. Add the award to your blog. 2. Thank the person who presented it to you. 3. List seven random facts about yourself. 4. List the rules. 5. Pass the award onto seven other bloggers. 6. Inform each blogger they have won by posting a comment on their blog. Ok, that was tough! There are so many great blogs that I frequent it was incredibly difficult to pick just seven. If they aren’t already on your “must read” list please be sure to stop and check out these amazing blogs! Thank you again Reese for the award and letting me be part of this. Hoe does she feel about the flying monkeys? They always sort of spooked me when I was little. Congrats on the award!! I too am afraid of balloons popping. Silly fear but real! OMG, that is awesome that your eyes are like that! I wanna see!!!! 🙂 Congrats on the award! People often assume that I wear colored contacts and that one of them has torn. Thank you Sarah 🙂 I have to tell you it was hard to just pick seven. I could have given one to everyone who has commented here so far! Congratulations!! I agree it is nice to be recognized by a peer! Ugh my two year drives me crazy, running around squeezing balloons. She thinks it's the funniest thing ever and I'm on the edge of my seat waiting for the silly thing to pop! Wow, this cheered me up after a pretty rotten few days! Thanks Shayna, I think the last time I recieved an award for anything I was 11 and in High School! Congratulations on your award! You deserve the recognition after all the hard work you put into your wonderful blog! Most of those 7 things could be said about me too, except the balloons and I have never eaten an ant. I did LOL when you said it tasted like cinnamon! Thank you for passing the award on to me! I am honored 🙂 I will try very hard to get my post scheduled soon. I have a few sponsors on me to get my reviews up first though. You know how that goes!